I have a love/hate relationship with food. I love to eat it, but my body hates me later for it. It took me a long time to figure out what foods cause my IBS symptoms to flare up and what I can eat happily with no pain later. But luckily with the low FODMAP diet, it made things a little more clear on certain foods and why they impact me in a negative way. Not everyone is going to react to foods in the same way, so please use the high FODMAP food list and the low FODMAP food list as you see fit. For your convenience, I have listed them below and provided a printer friendly version. 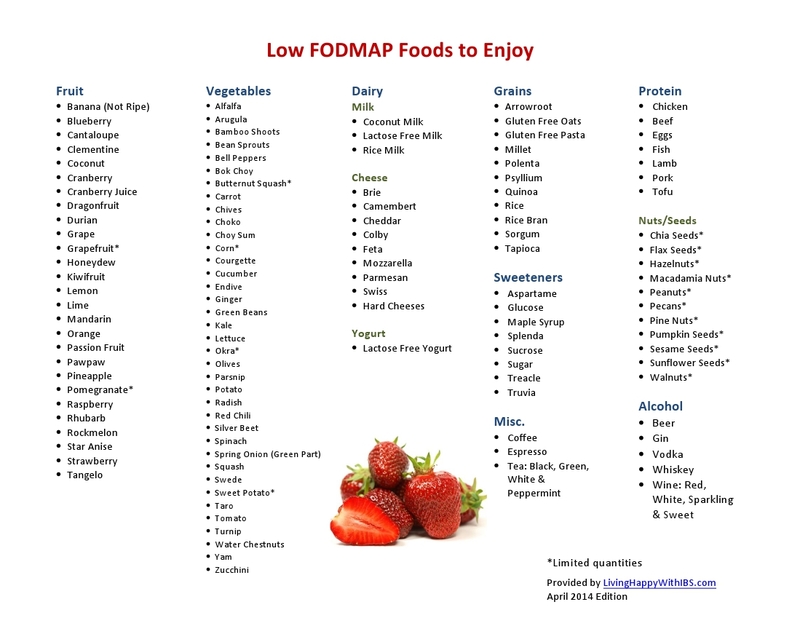 This low FODMAP food list was updated in April 2014. It’s extremely important to review the ingredients on any packaged foods prior to purchasing food. For example, while tomatoes are deemed safe, every tomato sauce on the market contains onions or garlic as an additive and many dressings, sauces, marinades, etc. are the same way. Also, manufacturers are always modifying their ingredients, so it’s important to review labels every time you purchase something. If you’re looking for some quick items to buy and eat right away, please reference the Low FODMAP Brand Name Packaged Foods I have compiled. It’s ideal for the lazy in all of us! Also, I have provided my favorite low FODMAP items, which mirrors my weekly grocery list and tips on how to get flavor in your food, without the FODMAPs. Please let me know if you think I may have missed anything on this list. Happy eating! The low FODMAP diet really helped ease my IBS symptoms of pain, bloating, gas and the occasional bout of diarrhea. The low FODMAP diet is designed to eliminate key IBS symptom triggers for a few weeks and slowly introduce them back into your diet to better understand what your body can handle and what you should continue to avoid. When looking over the list of foods, it is initially very scary to see all the things that should be eliminated out of your diet. Many of the items are ingredients in commonly used products, such as salad dressings, pasta sauces and marinades, so it’s very important to read through all the ingredients when purchasing a product. It’s also essential to know that new items are constantly being tested for FODMAPs, so the list is always changing as more is discovered. Beware of out-dated FODMAP lists that seem to be everywhere online. This high FODMAP list is based on all testing directly from Monash University and was updated in April 2014. 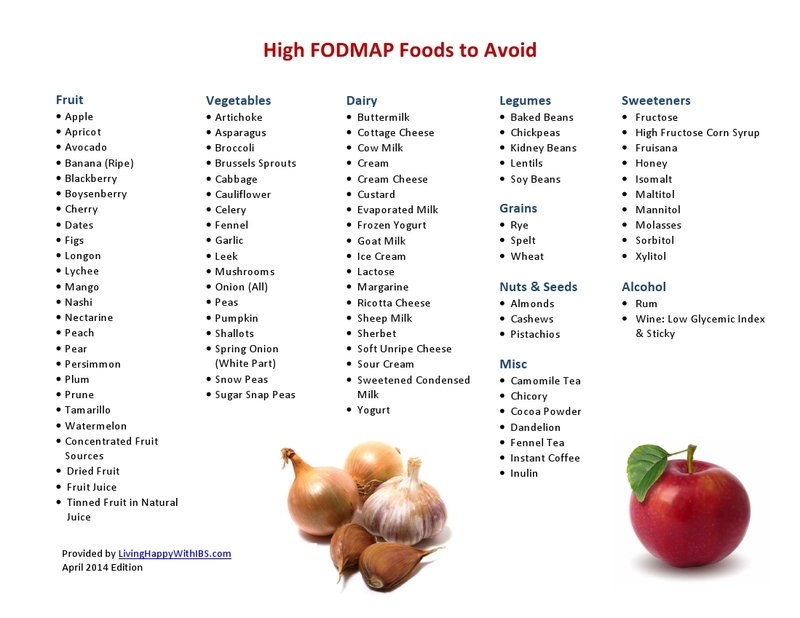 Below are the high FODMAP foods that should be avoided when on the diet. For your convenience, I have listed them below and provided printer friendly versions. Like I said, it’s overwhelming to read through that list and see some of your favorite foods on the list. For me, I am not a great chef, so the realization that I would have to make all my own sauces, dressings, dips, etc. was a lot to handle. So… what can you eat? I’ve also outlined a helpful list of low FODMAP foods that are deemed safe, as well as a Sample Meal Plan and Brand Name Packaged Foods to eat. Also, I have provided my favorite low FODMAP items, which mirrors my weekly grocery list.